Julian Glover has nearly five decades of television, film and stage acting to his credit. I’m sure I can’t even begin to name his best works, but I can list some of his works that are more recognizable to us. Most recently he played Triopas in Troy, and voiced the giant spider Aragog in Harry Potter and the Chamber of Secrets. He also played Walter Donovan in Indiana Jones and the Last Crusade, and led the attack on Echo Base as General Maxmillian Veers in the Empire Strikes Back. Bond fans may know him as Kristatos in For Your Eyes Only, and he’s made his share of Doctor Who appearances as well. Mr. Glover has been a long-time signer of autographs through the mail. Typically he will sign anything sent to him, and often sends his own photo too. Many people have received responses in less than 2 months…less than a week if you live in the UK. This is a wonderful opportunity to get a signature from a great actor. I received a response today. Mr Glover signed my index card and personalized my two trading cards. Unfortunately my cards got slightly bent in the mail...one of the risks of through the mail collecting. However, three signatures for free is worth the risk. I sent a large SAE in hopes of receiving a photo from him too, but he must have been out. Plus I didn't specifically ask for one. Well hot damn! Glover was probably one of my most wanted SW actors and today he came through. He signed the pic of him as Veers I sent, as well as one I sent of him as Donovan. Personalized both to me with the character's name as well. I used a different address, which I'll post for FYI's sake. Sent on 7/6/06, received 7/20. I believe I included an IRC - or else at least a couple dollars. As always scan will be on the site - up to over 60 successes since June. Now that i finally have my post office on track with the IRC's, i can finally send some of these non-us requests that i have. i got my response today. he returned one of my items unsigned but included one of his own. i can't quite make out what is written above his name on the one that he included. can anyone else make it out? 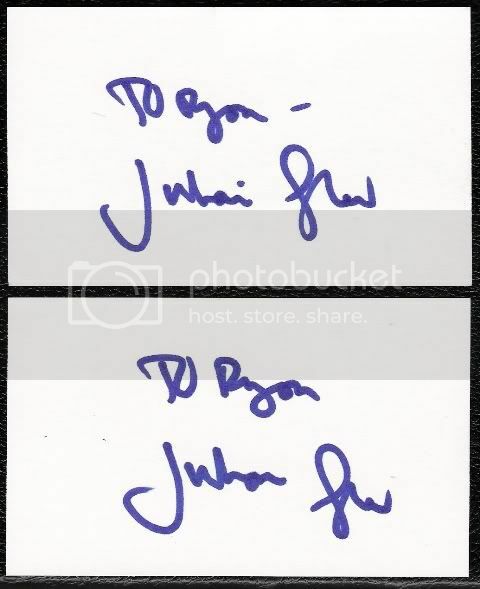 Looks to me like he wrote "Regards from Julian Glover". Just my guess! Yes he put regards to me as well. Got Oliver Ford Davies back same day, cool being I also sent them the same day. Sent on 8/10, received on 8/19! you think if i sent a figure, he'd autograph that? He might, but figures and such are more of a hassle because they take more time to be packed, and probably a good 10.00 U.S. dollars for return shipping. I know Jeremy Bulloch doesn't sign figures because they pretty much always mean a trip to the post office. Make it as quick and easy as possible on these guys, they do have lives outside of signing our stuff. You'll have better results. Maybe find a transparent sticky label you can have them sign and you can put it on your figure. 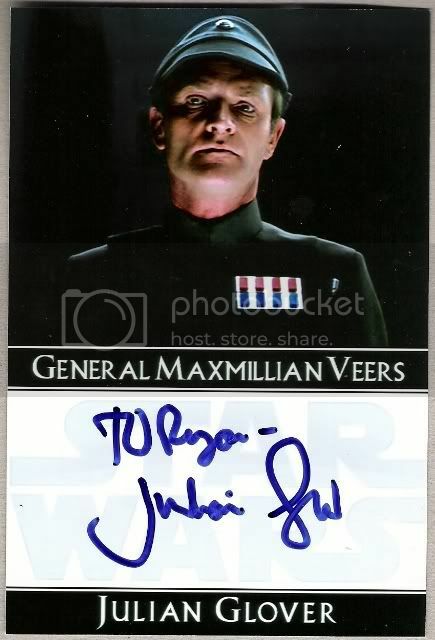 Got success today.Julian Glover signed 5 cards for me.What a great man! My Letter will be going out Tuesday December 26th!! Index Cards in Blue Sharpie. My SAE was used. A fast success, only taking 14 days. I sent a 8x10 and 2 trading cards, along with an SASE, and a letter. Received all back signed and inscribed. My action figure and cards - signed and returned in 4 days!!! WOW! That is fast. Since you already live in the UK. Mailing items to the USA takes a little longer Are you going to post pictures of your success? Pictures will follow. Having digital camera problems at the moment!! !